Since 2004, SCAR has been holding an Open Science Conference together with its Biennial Delegates Meeting. The 2018 meetings will be held in conjunction with the Arctic Science Summit Week and the International Arctic Science Committee (IASC) in Davos, Switzerland. It has been tradition, when possible, that the COMNAP Annual General Meeting is also held with the SCAR meetings. For 2016 and 2018 the meetings were not held jointly as COMNAP rules require their meetings to be hosted in COMNAP member countries and Malaysia (2016) and Switzerland (2018) are not currently members of COMNAP. Australia has submitted a bid to host the 2020 meetings in Hobart. Australia is a member of both SCAR and COMNAP, thus the bid includes hosting both meetings. Australia also graciously hosted the 2006 SCAR meetings in Hobart. 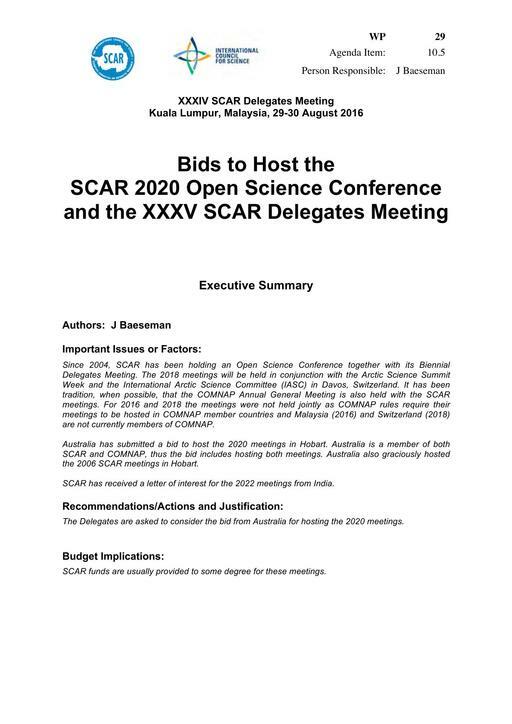 SCAR has received a letter of interest for the 2022 meetings from India. Recommendations/Actions and Justification: The Delegates are asked to consider the bid from Australia for hosting the 2020 meetings. Budget Implications: SCAR funds are usually provided to some degree for these meetings.